With the film ‘Insidious: Chapter 2’ hitting number one at the box office this weekend, I can’t help but feel a little bittersweet. You see, I was originally set to write this film. However, as you can see from the below notes on my script, studio executives were anything but pleased with my work. p. 10 – The baby stroller moving on its own is creepy enough by itself. Let’s scrap the part where we cut to a ghost, hiding in the closet with a remote control. p. 11 – Same with the part where the piano is playing on its own. We don’t need the previous scene where the ghost is installing a “self-playing piano kit.” Ghosts shouldn’t need technology to make scary things happen. p.18 – We’re not even 20 minutes into the film and this is already the 12th time someone has been “slimed” by a ghost. It’s really getting old and it seems like the characters can’t get a word in edgewise because of it. 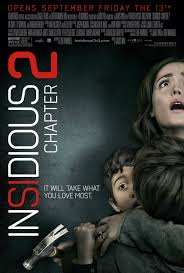 p. 25 – What’s the point of having the paranormal investigators even appear in the film if all they are going to do after hearing about the strange things happening inside the house is say “nope, way too scary” and leave? p. 39 – The haunting in this script would be a lot more effective if the characters would stop checking Facebook during them. p. 50 – Here you say “Carl is hypnotized to go into the further to retrieve Josh. To save money, instead of showing what’s happening in the further, just show Carl with his eyes closed making weird faces.” This would be very boring. We don’t need to save money that bad. p. 55 – “The demon closes in on Carl. Carl’s eyes widen in fear. ‘Game Over’ appears on screen. Off screen you hear someone go ‘aw man!’ Pull back to reveal two guys sitting on a couch playing video games. It was all just a video game. So was the first film.” This is possibly the worst ending to a movie we have ever read. The audience would be enraged to learn that everything they were watching was a video game. They would also be infuriated to find out that you’ve taken the liberty to ruin the ending of our first film as well. On top of this, 55 minutes is way too short for a feature movie. Tim, you have taken what has started as a great horror franchise and somehow tainted both films with this script. We are going with a different writer. My comment would be much funnier, but I’m too busy checking Facebook. Agreed. I think in chapter 3 it will just be a Casio keyboard set on samba.